Many times I am told we are entering another “Golden Age” of Dinosaur discoveries. Certainly, advances in research techniques are permitting palaeontologists to learn far more from each specimen than they ever did before. The use of MRI and CAT scans, and techniques such as the creation of endocasts (casts of the inside of fossils such as skull cavities) have opened up a whole new window of knowledge. Our methods have certainly improved since the first “Golden Age” of Dinosaur discoveries – the 1860s and 1870s when the likes of Marsh and Cope competed with each other to excavate dinosaurs from western North America. To date there has been over a thousand different genera of dinosaurs described, with a new dinosaur being discovered on average every 4-6 weeks. Scientists are exploring areas that have not been studied before, parts of India, Madagascar, China, Argentina and Antarctica. The development of CGI and other special effects has enabled prehistoric animals to be depicted in films like the Jurassic Park series and on television with the “Walking with Dinosaurs” compilation. I am amazed at the diversity of Dinosauria. They certainly had the best part of 160 million years to change, adapt and fill every terrestrial niche. Unfortunately, it is very unlikely that we will ever discover all the dinosaur genera. The process of fossilisation and preservation happens only very rarely and certain habitats such as forest environments make the possibility of fossilisation extremely remote. Still this does not stop scientists trying to imagine what other creatures may have existed or indeed speculating on what we may find in the future. Considering dinosaur diversity there are many possibilities. Take Titanosaurs (long-necked dinosaurs), for example. Within this group we see incredible diversity and geographic spread, with fossil Titanosaur remains having been excavated from the USA, Europe, Africa and South America. The largest dinosaur yet to be fully described – Argentinosaurus may have exceeded 100 feet in length and weighed more than 100 Tonnes, yet, smaller almost dwarf Titanosaurs are also known. Palaeontologists working in Romania have recovered fossil bones of a relatively small Titanosaur. It has been named Magyarosaurus (full species name M. dacus). This late Cretaceous Titanosaur may have only been about 5 metres long as fully grown adults. Scientists have speculated that at the time this animal roamed about what was to become Transylvania; the area was mostly covered by a shallow sea with small islands dotted about. Dinosaurs living on these isolated areas of land, found resources limited and gradually evolved into dwarf forms in response to the limitations of the environment. 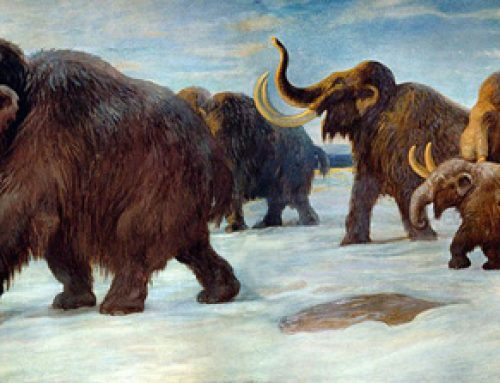 Dwarfism in island species is quite common with dwarf mammoths and elephants having been reported in the past.